A call to Camper and Nicholsons in Fort Lauderdale brings news of a price cut on Fernado Nicholson's central listing, the 36.6m motor yacht Andiamo. 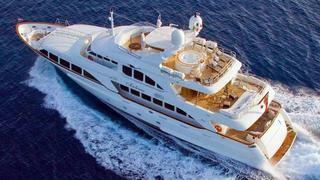 A Benetti Classic 120, she was built in 2006 to a design by Stefano Righini. ABS classed and MCA compliant, this superyacht accommodates 10 guests in a master stateroom on the main deck along with three VIP suites and one twin cabin. The panoramic sundeck features a sunshade, barbecue, bar fridge, Jacuzzi, private shower and sun loungers. Twin 1500hp MTU engines give Andiamo a cruising speed of 12 knots and a range of 2,222 nautical miles. Her price is now down from €9.49 to €8.8 million.